Exit the station on to Trafalagar Square. Turn down Whitehall, and the museum is on the right hand side after approximately 50 metres. Age restrictions: Child ages 5-15 years. Children under 5 are free of charge. Opening hours: Open daily from. 10am to 6pm April - October and 10am to 5pm November - March. Closed on 19 April, 28 April, 24-26 December. Important info: Disabled access: Please contact our reservations team for more information.In order to gain entry you must present a printed copy of your voucher.Visitors may wish to make the most of visiting in time for:11:00hrs Guard change on the Parade Ground (10:00hrs on Sundays)16:00hrs ‘Punishment Parade’ in the Till Yard (Off Whitehall)Please note that there are no catering facilities on site. You can see troopers working with horses in the original 18th century stables and hear first hand accounts of their rigorous and demanding training. The experience comes alive with compelling personal stories, interactive displays and stunning rare objects - many on public display for the first time. The Household Cavalry Museum sits within Horse Guards in Whitehall, central London, one of the city's most historic buildings. 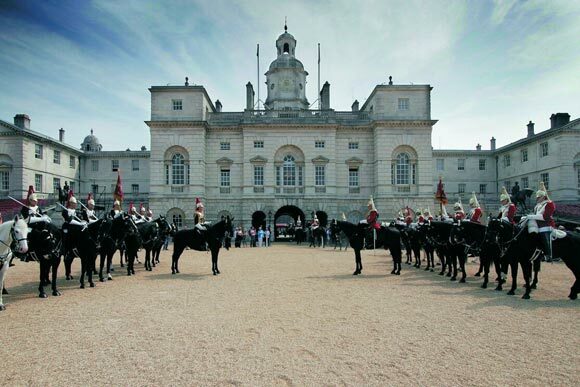 Dating from 1750, it is still the headquarters of the Household Division, in which the Household Cavalry has performed the Queen's Life Guard in a daily ceremony that has remained broadly unchanged for over 350 years. The Household Cavalry was formed in 1661 under the direct order of King Charles II and now consists of the two senior regiments of the British Army - The Life Guards and the Blues and Royals. We have two roles: as a mounted regiment (on horseback), we guard Her Majesty The Queen on ceremonial occasions in London and across the UK and are a key part of the Royal pageantry; as an operational regiment we serve around the world in armoured fighting vehicles. We currently have units deployed on active service in Iraq and Afghanistan. Over the centuries we have amassed an outstanding collection of rare and unique treasures from ceremonial uniforms, royal standards and gallantry awards to musical instruments, horse furniture and silverware by Fabergé. Each exhibit has its own compelling story to tell and many are on display for the very first time. You can see two silver kettledrums given to the regiment in 1831 by William IV; the pistol ball that wounded Sir Robert Hill at Waterloo and the cork leg which belonged to the first Marquess of Anglesy, who, as the Earl of Uxbridge, lost his real one at Waterloo. Modern additions to the collection include Jacky Charlton's football cap - he did his national service with the regiment and Sefton's bridle - the horse that was injured in the 1982 Hyde Park bombings. Much of the collection has resulted from the close association that has existed between the Household Cavalry and Royalty. We have, after all, protected successive kings and queens from rebels, rioters and assassins for nearly 350 years.